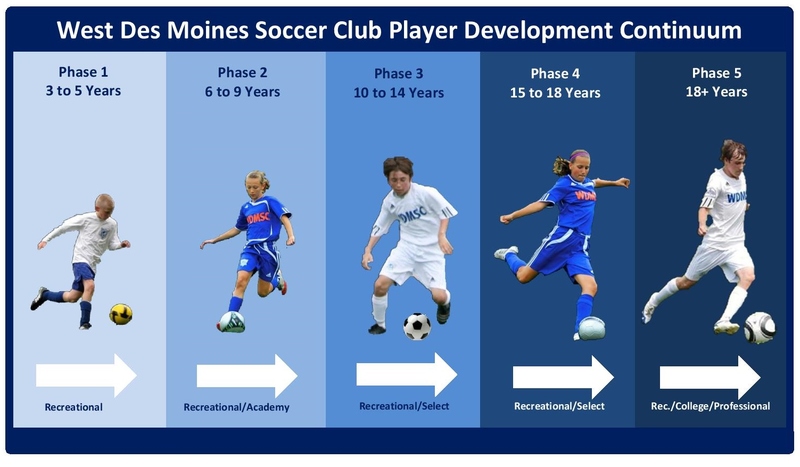 West Des Moines Soccer Club is unique in that we have adopted a Long Term Player Development (LTPD) model as our framework for player development. Our Five Stage Player Development Model is an adaptation of the Long Term Athlete Development (LTAD) model created by Dr. Istvan Balyi, which illustrates that developing athletes to their full potential is a process that can take eight to twelve years. The WDM player development model is designed to provide a seamless transition from one stage to the other. It is a framework for age and developmentally appropriate instruction as well as systematic planning for optimal enjoyment, development, and performance in each stage of the developmental process. As illustrated above, WDMSC provides a natural pathway for players to develop from childhood until they graduate from our program. We offer various programs (i.e. Recreational, Academy, Select) with curriculum specifically designed to meet the developmental needs (physical, psychological, emotional, social, and ability) of the players. Effective Fall 2016 statewide in Iowa, players will now be placed in age groups depending on their birth year, i.e. 2009- U9 player, 2008- U10 player, etc.